The rise of UKIP should be of serious concern to real Nationalists. UKIP are riding high in the polls, capitalising on the disillusionment and cynicism that many feel towards the LibLabCon. Disenchantment with the corrupt, extravagant and unaccountable EU continues to grow and UKIP is targeting local (county council) elections this year, hoping to win more seats in the European parliamentary elections next year and the UK general election in 2015. UKIP present themselves as saviours who will free our country from the chains of the European Union. Many appear to have taken these claims at face value without taking a closer look at their organisation and policies. The Nationalist Trade Union Solidarity has already pointed out the anti-worker policies of UKIP. They want to scrap whole swathes of employment protection and are more Tory than the Tories. Workers would have few rights if UKIP had their way. 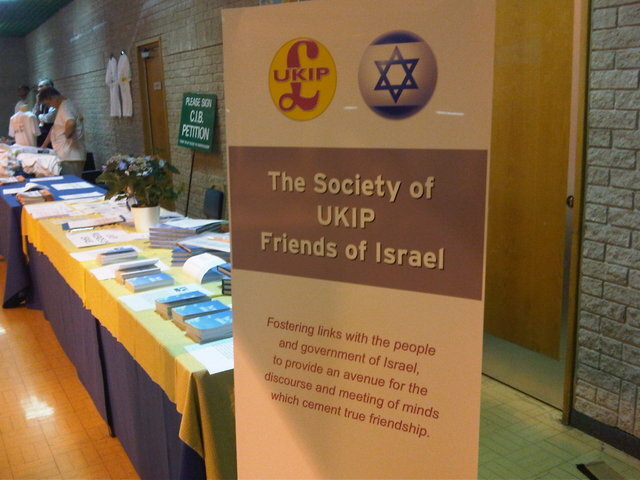 UKIP still promotes the “brave, little Israel” propaganda so beloved of elderly Zionists. They would have you believe that Israel is a beacon of democracy which only defends itself from attack. Yet we know that Israel is an aggressive military power that treats the Palestinians as less than human. Palestinians are prisoners in their own country forced to live behind walls and barbed wire and show passes to get through. They are strangers in their own land. What Nationalist could not feel sympathy for their plight? What Nationalist could say that the Palestinians did not have the right to their own State on their own land? UKIP speak of “political dialogue” between the Palestinians and Israelis but rule out any measures that other nations might take to pressure Israel to negotiate. They hope that the talk will go on and on and change nothing just as it has for so many years. Meanwhile the situation on the ground for the Palestinians gets worse and worse. UKIP say nothing about the illegal occupation of the West Bank and the blockade of Gaza. They say nothing about the way the Israeli Justice system treats Palestinians. The thin pretence of balance isn’t even attempted by “UKIP’s “Friends of Israel” (don’t expect a UKIP “Friends of Palestine” anytime soon!). The group is backed at the highest levels in UKIP. Michael Zuckerman, UKIP secretary, told the Jewish Chronicle (JC) : “There is tremendous support for Israel within UKIP”. The JC also reports that the Party leader is onboard: “Mr Farage strongly supports moves by the party’s most senior Jewish figure, its secretary Michael Zuckerman, to establish an active Friends of Israel group”. As you would expect from some second fiddles in the Zionist orchestra UKIP find a nuclear Iran unacceptable and say they would support efforts to eliminate its nuclear weapons capability “by targeted military means” if necessary. What form this “support” would take is not made clear. Nationalists don’t want anything to do with an attack on Iran or any other country which doesn’t attack us. We have no desire to fight proxy wars for Israel or anyone else. Genuine Nationalists view with great suspicion the motives of those who promote war and conflict with Iran and other nations. The way in which the Zionist lobby seeks to influence the foreign and defence policy of our nation should be a matter of grave concern. Israel possesses hundreds of nuclear warheads (and the means to deliver them including German supplied submarines) and defies calls to sign up to the Nuclear Non-Proliferation Treaty and place all its nuclear facilities under comprehensive International Atomic Energy Agency safeguards. A nuclear Israel is not a problem for UKIP though it seems. No Nationalist should be under any illusion, UKIP will sell-out our country, involve us in foreign wars and support a Zionist agenda which places the interests of Israel above the interests of Britain. UKIP are no different from all the other sell-out politicians we have to suffer in this regard. A UKIP vote is a vote for more of the same not for change.